I love the idea of Sunday Supper, don't you? Beautiful spread on the table, family gather around. But the reality of the situation is, Sunday is one of the busiest days of the week for me. I have to be at church early for worship practice. I'm usually there till 12:30, 1:00. By the time I get home I'm in no mood to spend hours in the kitchen cooking. That's why usually we eat out on Sunday. But yesterday I decided to try something new. I decided to try cooking a whole chicken in my crock pot. Before I jump into explaining how I did this, I need to go over a couple things. If you are working with a thawed chicken, you will want to make sure you remove the neck and giblets from the cavity and pat it dry before putting it in the crock pot. To begin I placed four, golf ball sized, aluminum balls in the bottom of my crock pot. This will help keep the chicken elevated out of the juices, so that it can evenly brown. If your chicken is thawed, cut the onion in half and place in the cavity. Now place the chicken, breast side up, on top of the aluminum foil balls in the crock pot. Drizzle with extra virgin olive oil and rub it all over the chicken. You can also use unsalted butter if you so desire. In a small bowl combine the seasoning salt, paprika, garlic powder, onion powder, salt, pepper, cayenne, and thyme. Now LIBERALLY season the chicken. Get under those wings, in the crevices of the legs. GET IN THERE! This is where all the flavor of this chicken is going to come from. This is what you'll have after 4 (well, 6 by the time I got home. lol) hours in the crock pot. This chicken is so tender that when I tried to pick it up to photograph it, it LITERALLY fell apart! It was so tender that I didn't even have to cut the breast away from the bone, it just fell away from it! AMAZING! I served the whole crock pot chicken with some of my Roasted Carrots and Potatoes. It was so delicious. Tender, juicy, and the flavor, WOW, out-of-this-world! Hands down the best chicken I have ever made! And so easy, I put this in the crock pot before church and it was ready when I got home. I know you and your family are going to love this recipe so get it in your crock pot for dinner tonight! Also, I would LOVE to hear about your favorite crock pot meals so leave me your ideas in the comments! Get a perfectly roasted chicken in your crock pot with my easy steps for How to Cook a Whole Chicken in Crock Pot Recipe. You won't believe how easy and delicious it really is! *If you are working with a thawed chicken, you will want to make sure you remove the neck and giblets from the cavity and pat it dry before putting it in the crock pot. If you are working with a frozen chicken you are going to want to look for a chicken that doesn't have the giblet bag in it. If you can't, no big deal. A little giblet bag and neck never hurt anyone. Place 4 golf ball sized aluminum balls in the bottom in the bottom of the crock pot. If working with a thawed chicken, cut an onion in half and place in the cavity. Rub the oil all over the body of the chicken. In a small mixing bowl combine the paprika, seasoning salt, onion powder, garlic powder, cayenne pepper, salt, pepper, and thyme. Mix it all together. LIBERALLY season the chicken, making sure to get under the wings and in every crevice of the bird. Place the lid on the crock pot and cook on HIGH for 4 hours or LOW for 8 hours. If you are working from frozen you will need to cook it on LOW for 8-10 hours. Baste with pan juices and serve. *You can use unsalted, room temperature, butter in place of the oil if you like. This is the BEST tutorial I've seen!! I totally want to try this. Thank you a million times!!! Exactly how I cook mine. Except...after lifting out with Turkey forks, I put on a pan under broiler to brown a bit. Yum!! I've been making chicken like this for years. I love it because it's so easy! I take the scraps from it and make chicken broth the next day. One time I brined the chicken before I cooked it. Oh. Em. Gee. You need to try it! Cari, Ironically enough, I have the stock brewing in the crock pot as I type! *lol* I have a lot of people telling me about brine. I am definitely going to have to check it out! How do you cook the stock? And once you eat the chicken can't you boil the bones for stock too? And now I need a crockpot chicken soup recipe! I usually cook my turkeys in the crock pot. Always nice and moist! Love crock pot cooking. So easy! I have never really been one to use my crock pot, but I am branching out a trying new things for sure. This recipe is definitely a keeper in my house! Yummmmmm. So good. I'm ready to make one now - but no whole chicken handy!! Oh now this is something I could actually cook in my crock pot! And it looks simple enough to try and yummy enough that my family will eat it... I'm gonna do it! Thank you!! Yay! I can't wait to hear what you think! I am actually trying to experiment with crock pot meals more. Thanks Ally! Oh man, we redid our kitchen a few years ago! I remember what it is like! I DO NOT envy you there! I am new to cooking and this looks so easy and yummy! I will definitely try this. I wonder if you can put potatoes on the bottom so that they cook and soak up all the chicken juices. Yes, you can! A friends of mine tried that. hi! can I cook this on low for a few and then high? it's 10am so I don't want it to be done too late. thanks, this looks wonderful for our "Sunday day of rest"
Hey Julie, I'm sure you could. I have never done it that way, but make sure the internal temp is 165 in the thickest part of the thigh befor you eat it. Oh yeah! I have totally done that! And I'm sorry it to me so long to respond. Somehow this comment slipped through. Mandee this looks and sounds excellent! Finally a slow cooker recipe that I will like! I only had a 7lb. cut up (home grown) chicken, so I put the back and breast bone-side down on the bottom, seasoned it, then bent a small cookie rack to fit and made a 'second story'and put the rest of the chicken on the rack. It works well. Thanks for the inspiration! I love that! I am all about working with what we have to get the job done! How creative! So you leave the skin on the onion or take off a layer? And have you ever used a Crock Pot Liner? My chicken ended up being too big, or my crock too small. Cooking now, but touching all the sides. Hope it turns out... Have to let you know. Three hours to go! 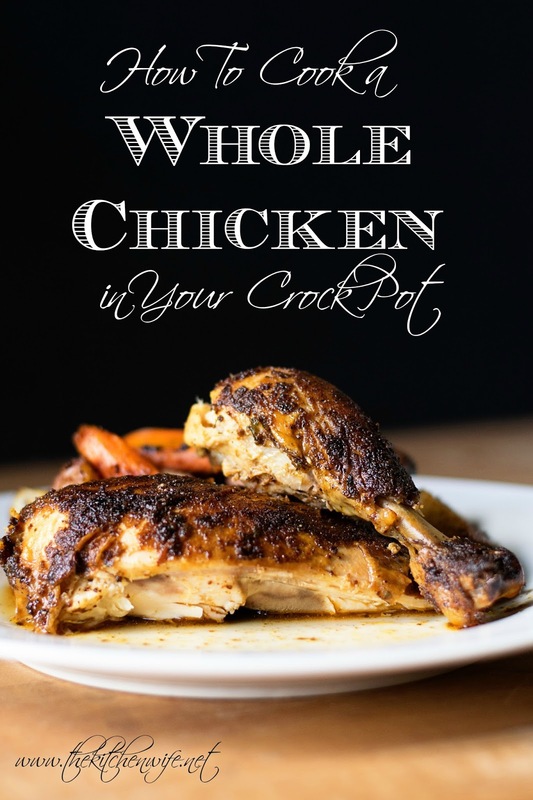 I am making this as we speak--I put oranges and onions inside the chicken--seasoned both sides before putting it into the crock pot--lets see what happens! So sorry I am just getting back to you! I love the idea of adding oranges! How did it turn out? 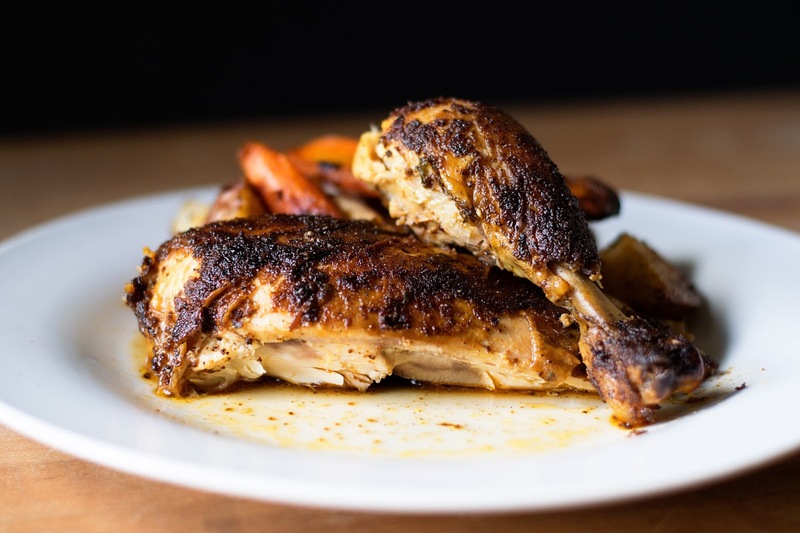 This recipe looks delicious... And I happen to have a whole chicken!!! One weird question though... The aluminum balls... They don't give anything a metallic taste? Can you use something other than foil to raise the bird? You can most certainly use vegetables! Sorry I am so late getting back to you on this Peggy! How did you like it? Tried this today. It is a KEEPER! My chicken was only about 2.5 lbs. so I only used about 1/2 the rub and I cooked it for 4 hours on high. What a treat to walk in the house from church and smell that chicken! It was SO juicy and tasty. I am also going to take the leftovers and make a chicken salad for some sandwiches this week - am sure it too will be delicious!! Thanks so much for a great crock pot recipe!!! YAY! I'm so glad it was such a hit! Thanks so much for stopping back by and letting me know! This was DELICIOUS and so easy. I followed the recipe, but added 2 spices. My husband's family is Middle Eastern so I added 1 tsp of all spice and 1 tsp of shawarma spice to the others you had listed. This was a simple recipe I'll make again and again - thanks for posting! I love that addition to the spices! I will definitely be trying it the next time I make this! Thank you so much for sharing, and I am so glad you and your family enjoyed it!!! Did u add water to the bottom or any liquid? No, no liquid at all. The natural juices in the chicken are all you need. I haven't made this yet (planning to later today), but thank you for getting straight to the point with the recipe and the clear cut directions with pictures!! You are most welcome! I hope you enjoyed it! I don't know what it tastes like, but it sure does have my house "stankin'" good! I can't wait to see the chicken fall off the bones! I'll be using said bones to make a bone broth shortly after cooking this bird too! Thanks for the recipe and easy peasy instructions! Sorry I am just now seeing this! So, did it fall of like I said? And you are so welcome for the recipe! Will the chicken be browned on the outside if not how should i brown it? It will be brown, but the skin will not be crispy. It is very similar to a store bought rotisserie chicken. I'm so glad you liked it! To be honest, I'm not sure about the gluten-free thing, but it would be a quick google. Made this recipe and it came out terrific!!! Made a gravy from the drippings at the bottom of the crock pot and its perfectly seasoned, didnt need to add a thing except the flour/water slurry. Thank you!!! That's great! I'm so glad you enjoyed it, and yes it makes AMAZING gravy!! !